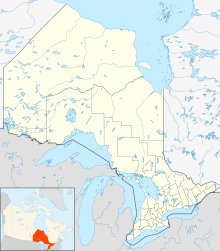 Earlton (Timiskaming Regional) Airport, (IATA: YXR, ICAO: CYXR), is located 1 nautical mile (1.9 km; 1.2 mi) southwest of Earlton, Ontario. The airport has a 5,998 by 150 ft (1,828 by 46 m) paved runway oriented east-west, and a 3,019 by 150 ft (920 by 46 m) gravel/snow runway oriented north-south. Past three hours METARs, SPECI and current TAFs for Earlton (Timiskaming Regional) Airport from Nav Canada as available. This page was last edited on 19 February 2018, at 20:16 (UTC).